On February 20, a group of twenty-two highly dedicated students traveled from all over the state with their teachers and supportive family members to the Alabama Shakespeare Festival in Montgomery to participate in the state finals of Poetry Out Loud. Alabama’s new State Champion is Margaret “Peggy” Payne from St. Peter’s Academy in Limestone County. Last year’s Alabama champion, Youssef Biaz from Auburn High School, traveled to Washington, D.C., to become the National Poetry Out Loud Champion. Payne said that she hopes to follow Biaz as 2012 National Champion. “Peggy was very close to Youssef last year in her scores,” reported Diana Green, Arts in Education program manager at the Alabama State Council on the Arts (ASCA). “When I saw her name on the list of regional winners, I knew she would have a good chance of making it to the top this year. 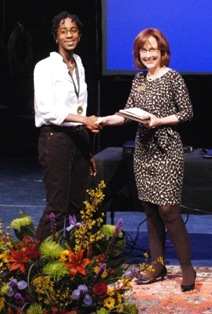 Doris-Anne Darbouze of Auburn High School placed first in the Original Poetry category. The Alabama Writers’ Forum underwrites two cash awards – First Place for $150 and First Runner-up for $75. First Place, First Runner-up, and Honorable Mention winners in Original Poetry receive a complementary one-year student membership in the Forum. All eight top winners in Poetry Out Loud receive contemporary poetry collections. Alabama’s unique element in the Poetry Out Loud competition provides an opportunity for students to recite their original poetry. The student poets who become their schools’ winners are invited to a Finding Your Voice workshop, where they are coached in the interpretation of classic poetry, poetry recitation techniques, and the writing of poetry. The Forum has mentored this element of the competition in keeping with its focus on literary arts education. Poetry Out Loud began eight years ago when National Endowment for the Arts chairman Dana Gioia partnered with the Poetry Foundation to design a program that would bring the love of poetry as an oral art form back into the lives and curriculum of high school students across the nation. After a successful year of implementation in Washington, each state arts agency agreed to host its own state competition and send a state champion to the national finals. Alabama’s Poetry Out Loud program is administered by the Alabama State Council on the Arts in partnership with the Alabama Alliance for Arts Education and the Alabama Shakespeare Festival. Additional partners, hosts for regional competitions, include the University of South Alabama, Alabama State University, the Arts Council of Tuscaloosa, and the University of Alabama in Huntsville.